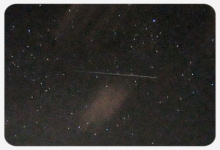 I almost forgot to post the annual Perseid Meteor Shower article this year, because the curse has indeed struck with all force – it has been raining non stop here since Thursday and the chance of actually seeing a Perseid meteor around here are somewhere around zero. The Perseids will peak on August 12 as usual, so the night from the 12th to the 13th will probably be the best chance to look for meteors, but generally the few days around the peak date are usually good too. If your weather looks good and you want to try watching, here are the usual links: If you want to know more about the Perseids, Universe Today has a really good Observer’s Guide written by David Dickinson and Fraser Cain’s short explainer video about meteors in general is also very recommended. In short, if you have a reasonably clear view of the sky to the east and northeast, you are all set to go! You don’t even need any fancy equipment, just your eyes and some patience are enough.